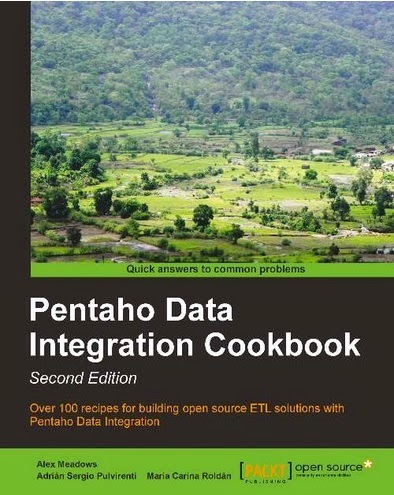 Pentaho Data Integration Cookbook Review ~ Business Intelligence y Big Data: ¡Aprende Gratis sobre Analytics! Pentaho Data Integration or also called Kettle is one of the best open source tool for tasks as extraction, transformation and loading data between different systems. It is integrated within the Pentaho BI suite and covers all necessary to develop and maintain a data warehouse / data mart functionality. Beyond the scope of BI, allows us to deal with and transform data in multiple ways. This book explains simply and with numerous examples how to get the most out of this tool Pentaho. It is mainly aimed at both developers who have basic knowledge of Kettle, and advanced users who want to know the new possibilities it brings a new version of the tool. As a general recommendation and for all chapters, I would add a new tip called such "advance trick" where reference is made to some more advanced features. It will always be useful for the user to keep in mind if you handle this case in the future.